In Volume 3 Plok is lured into the cave of his old SNES nemesis the Flea Queen, but things aren't quite as straightforward as they used to be. Zob the Galactic Ranger discovers that the Queen's brood has hatched and escaped, leaving behing only the runt of the litter, Captain Skint, who he takes with him, encouraged by his remote compantion Xöb. Zob reaches the Queen before Plok, and awaits his arrival. Hang on, could Plok be the bad guy here? 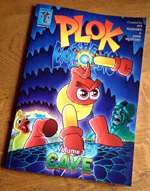 The third Plok comic strip edition collects episodes 50 to 76 of the webcomic and includes many exclusive extras. » View all 27 episodes of Volume 3 as a single long webpage. All 27 episodes of Volume 3 are available to read - for free! - right here. The Runt meets the Ranger. Plok misses out on a bargain. Say, friend, have you heard about this brilliant iOS game? Plok remembers more of his old power. 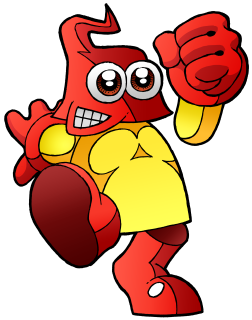 Plok takes back his arm without paying a penny. Commander Zob makes a new friend, and a new enemy! Zob and Captain Skint have nothing to fear after all. Plok tracks down the flag thief, with a little inside info. Hey, these doorways weren't here when Zob entered the cave. Plok doesn't like hard games. Irony. Wubba commits a typographical sin. You know when you keep trying but don't get any better? That. Wubba picks a font, and, well, we haven't had an explosion in a while. Zob and Captain Skint enter the Queen's lair. Plok is about to get his notepad out to draw his own map. Plok and co hold an impromptu press conference. Plok learns that peril is milder than it first seemed. Who has time for stupid puzzles? Plok goes through the Boss door. Readers, Plok needs your help! He tried to handcuff Plok? Really? Plok on the run, after escaping from the cave!